Credit: yoppy/Flickr/CC BY 2.0 licensed under . Credit: Ken OHYAMA/Flickr/CC BY-SA 2.0 licensed under . Credit: chinnian/Flickr/CC BY-SA 2.0 licensed under . Credit: ajari/Flickr/CC BY 2.0 licensed under . Setagaya City, as it is known in English, or Setagaya-ku in Japanese, is one of Tokyo’s 23 wards and the most populous one with almost a million people calling the area west of Shibuya home. Its close proximity to the city, ample green spaces, and its reputation for being a family-friendly neighbourhood make it a popular choice for many Japanese families and a few foreign residents alike. Quiet, safe and residential are the attributes that best describe this ward. One of the few bustling centres is the area surrounding Futakotamagawa Station, which boasts several shopping malls, a cinema complex, and a Japanese garden. Closer to the city, just a few minutes from Shibuya, you can find the trendy area of Shimokitazawa, popular with young people and famous for its secondhand fashion and cool bars. Mainly made up of detached houses, the rest of the neighbourhood is generally quiet and peaceful and dominated by families. While being close to the city centre, at the same time there is ample green space to enjoy, especially along Tama River that dissects the ward. The wide riverbanks with well-maintained footpaths invite residents to strolls, ball games, or picnics. Todoroki Ravine, known as Todoroki Keikoku in Japanese, is a remarkable green jewel that allows visitors to forget how close they are to the city center. Kinuta Park is a very large green space popular with residents especially during the cherry blossom season. The biggest drawback of the area is probably the commuter trains that service it and become a bottleneck during rush hour and can be extremely crowded. An estimated 900,095 people live in Setagaya, making it the most populous of all of Tokyo’s 23 wards. For a total area of just over 58 km2, the city has a population density of 15,497.5 persons per square kilometre — one of the highest in Tokyo as Setagaya is primarily a residential area. The areas closer to Tokyo, Sangenjaya and Shimokitazawa, are known as trendy neighbourhoods and are popular with younger people, both Japanese and Western, in their 20s and 30s. The area around Meidaimae Station is favoured by students of its namesake, Meidai University. The Tamagawa area has recently been gentrified with both office and commercial developments, including the Rakuten headquarters and a new shopping mall, making it a popular choice with young Japanese families. According to a 2018 survey by Setagaya ward office, more than 75% of residents that responded were families living together as either one (husband and wife), two (parents and children) or even three generations (parents, children and grandparents). Only 15.1% of respondents in the ward said they were living alone. Forty-five percent of respondents further reported that they live in a detached house, which they own, making up the majority. This was followed by 16.7% who own the condo they live in. Official data for 2017 by the ward office revealed that in 2018, 11.9% of inhabitants of Setagaya where 0-14 years of age, while 67.9% fall into the 15-64 years age bracket and 20.2% of residents are seniors of 65 years or older. Of the 900,107 residents registered in 2017, only 19,931 were foreign. Chinese constituted the biggest group, with 6,266 persons, followed by 4,314 Koreans, and 1,550 US Americans. There are several big shopping malls located at Futakotamagawa Station. The Rise Shopping Center was opened in 2015 and also includes a cinema. Tamagawa Takashimaya is an offshoot of the main store in Shinjuku. Yanagi Koji Mall is a small, high-end mall with a traditional Japanese flair. Okusawa Hospital in Setagaya has English-speaking physicians on duty. There are gyms, including convenient 24-hour gyms, and yoga studios located all across the ward. The most accessible to foreigners are Konami Sports Club at Tamagawa Station and Tipness in Shimokitazawa. Setagaya is home to three international schools: The British School has a campus here, St. Mary’s boys school is located close to Futakotamagawa, and Seisen International school also calls Setagaya-ku its home. Many of the stations throughout the ward have an international supermarket nearby. In total, there are ten Kaldi stores, seven Seijoishi, two Gyomu supermarkets and one National Den-En. Futakotamagawa, the heart of the district, is about 15 minutes on the train from Shibuya and it will take you around 40 minutes to reach Tokyo Station. To Haneda Airport, you are looking at a 55 minute trip, while for Narita Airport you should budget around 2 hours. Shimokitazawa, the closest area to the city centre, is just 5 minutes on the train from Shibuya and you should calculate around 30 minutes to Tokyo Station. For Haneda Airport, you are looking at a 50 minute trip, while Narita Airport will take you around 90 minutes. According to homes.co.jp, the average rent in Setagaya-ku is around JPY 3,000/sq. m. Therefore, a studio apartment of 25 sq. m. would set you back JPY 75,000, and a 1LDK suitable for a couple around JPY 140,000. 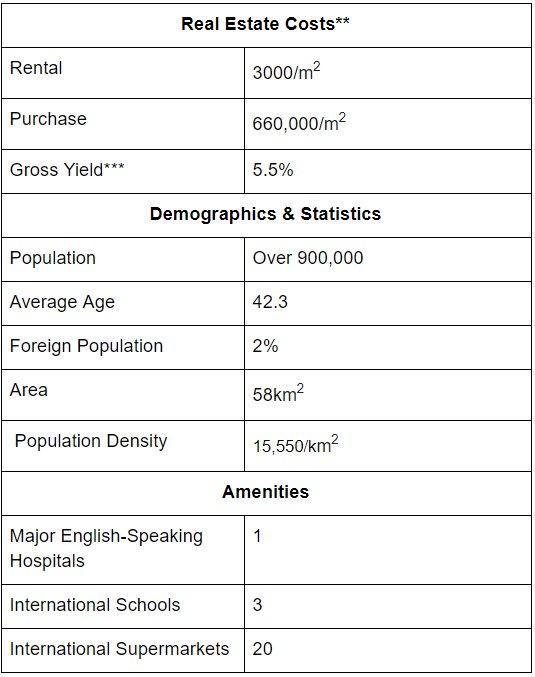 However, most properties in the ward are detached houses owned by their residents. Last year, they sold for an average of JPY660,937/sq. m., according to the Ministry of Land, Infrastructure and Transportation, with the average property sold measuring 152.8 sq. m. This represents an increase of 5.6% compared to the previous year. A trend toward family homes under 100 sq. m. was noticeable. The median price for properties sold was JPY 69 million.